Are you an adrenaline junkie? Looking for fun things to do in Dublin? Here are our top 5 adrenaline activities. Are you an adrenaline junkie who can’t get enough of activities that get your heart racing? If you’re in Dublin, you’re in the right place for it. You may not know it, but Dublin is a haven for adrenaline junkies everywhere. There are so many fun things to do here that are sure to get your blood pumping. Looking for some fun adrenaline activities to try out in Dublin? Look no further, here are 5 you must be sure to check out. Escape rooms have become super popular within the past few years and they make for a fun experience. The goal is to try and escape the room you’re locked in by following clues. It may not sound super adrenaline-pumping, but in Dublin, they have a twist. Instead of being locked in a room, you’re locked on a boat! There are a few different types to choose from and they all make for an immersive experience. It’s something different to do and is a great way to get the adrenaline flowing. It’s also a great team building activity and will help you get to know your team much better. Skydiving is the most classic adrenaline activity out there. While some people can’t imagine throwing themselves from a plane, others get a big thrill out of it. 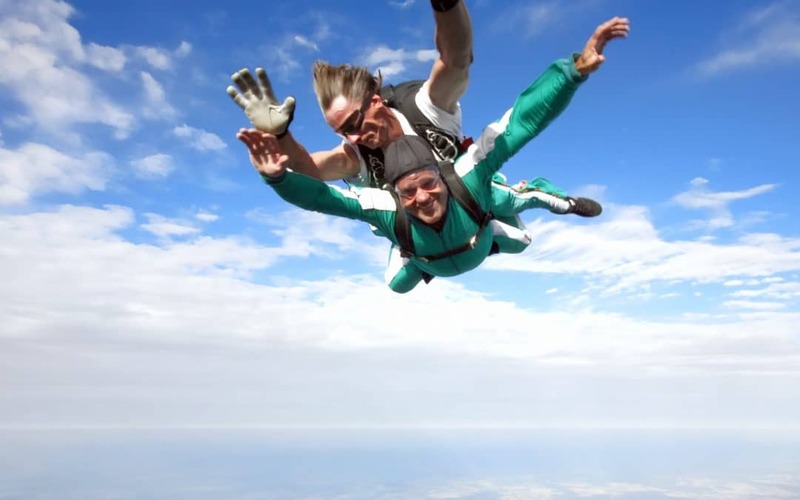 Skydiving is a must-do for any adrenaline junkie. Whether you want to go solo, tandem or assisted, there’s something for you here. It’s a little outside of Dublin, and you can find flights over in Edenderry within County Offaly. It takes a little under 2 hours to get there and makes for a great experience! Mountain biking is a great form of exercise and is a great way to get a big adrenaline rush. There are many different mountain biking companies operating throughout Ireland and near Dublin. Not only does it get the blood pumping, but it’s also a great way to experience the beautiful nature in Ireland. Nothing compares to whizzing through the forests and pedalling full-speed down the tracks. No matter what your abilities or experience, there’s a place for everyone to get on a bike and start riding! Close to the city centre of Dublin, you can escape the hustle and bustle of the city to go river rafting. It’s a fun way to get that adrenaline rush and anyone can do it! Like mountain biking, it’s another great way to experience the Irish countryside. As you navigate your way through the rivers you’ll see incredible wildlife too. It only takes 2 and a half hours and it’s a great group activity, so make to put it on your bucket list! Microlighting is a super fun experience where you take flight on a mini plane. It’s a wonderful and freeing experience that gets your blood pumping when you’re up that high. You’ll find a great place to Microlight in Laois, which is only an hour and 20-minute drive from Dublin. It’s an exhilarating thing to do and it offers a whole new way to see Ireland in all its glory. You may not think of Dublin as a huge location for adrenaline junkies, but rest assured there’s plenty to do here. These are some of the best adrenaline activities you can experience right in or nearby to Dublin. Looking for more activities to try out in Dublin? Check out our blog post about things to do in Dublin at night. Escape Boats is the world's first Escape Room on a boat. Inspired by immersive escape rooms. We found the Zorg Ella boat in Holland, brought her back to Ireland and carefully refitted her with the nautical SOS game. Be prepared for something completely different. Escape Boats is part of a new generation of Escape Games - we hope you enjoy it! The setting is the best, the enigmas basic but very well done. We had a great time and do recommend! It’s such a unique and fantastic experience. It was so much fun! I highly recommend it. It was fun and original to run the escape game on board. Great experience to enjoy with friends ! So so cool. Don’t miss this. We had a really great time doing this. The lady running it was lovely and just the right side of helpful. The ‘story’ we did was really clever and we loved loved LOVED the finale. We left on such a buzz. I wish I could wipe the memory of the clues from my brain just so I could do it all over again. Unique design - well done. The SOS game was great fun. Was our first escape game for my wife and I and we enjoyed the attention to details, realism and creativity in the entire setup. The concept of escape games is always fun and a great way to interact with colleagues/friends/family. Unfortunately, the experience here is poorer than others I've been to: avoid at all cost if you are claustrophobic and dislike loud sounds. A siren was blasting in our ears for 15minutes and the host kept shouting us inaudible clues. If you have to give so many clues, you may rethink your puzzle. Great fun!! One of the best escape games in Dublin! Highly recommend the S.O.S. game. Itwas perfect for three people.